Orchids and Onions: Beneath the paint. When I moved into my first flat my Aunt Nancy gave me a few of her old, wooden bookshelves to furnish the place with. I'd wager that she'd had the bookshelves since she had moved out of her own parent's house in the mid-1960s. Back in 2003, I passed two of them along to a friend who had recently moved home, and kept the smallest one for myself. The one I still have stands about 3 feet high, and, until recently, had a really funky paint job. 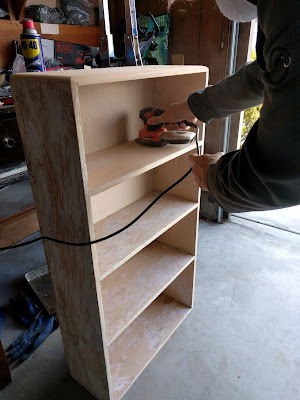 A few months ago, the hubs and I set about removing the paint from the little bookshelf. 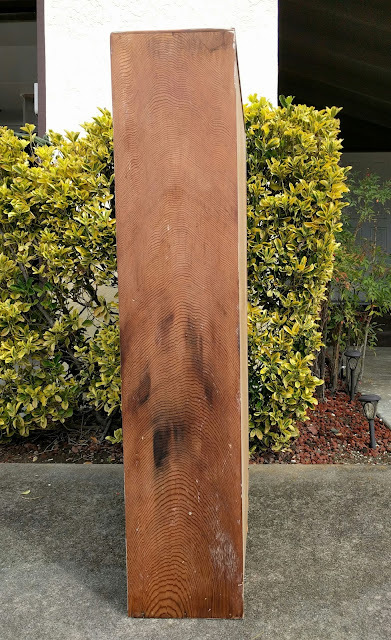 We thought that with a bit of elbow grease and lots of paint remover that we could somewhat easily remove the paint, then sand the wood down, and start anew. Boy, were we wrong! We discovered that the bookshelf had been painted over a couple of times since its creation. These layers of paint absolutely did not want to come up off the wood. We did a sort of 'half job' with most of the paint removed from the exterior of the piece, but the shelves themselves remained a yellowish-tan. It was especially hard to try and pry paint from the corners with steel wool & scrapers. Yesterday, the hubs purchased an electric sander in the shape of a clothes iron. With that he was able to take off most of the paint that was still clinging on with the exception of the very corners of the shelves. No matter, as we'd be soon covering with shelf with books. Who'd notice? Revealing the natural wood led to a surprise. We found that one of the planks used to fashion this bookshelf was taken from a very old tree. You can see in the above picture that the rings of the tree cover the entire length of the wood. The hubs counted 100 rings from the top of the board to about about halfway down. We're guessing that the timber must have come from a tree that was probably over 200-years-old. I'm wondering if the black smudges down the side mean that the shelving survived a fire. I really don't know. I try to image what type of tree it was--I can't tell--and where it might have stood. To think a tree that began its life in the 1700s wound up becoming part of a lowly, 20th century bookshelf. Wow. It is mindboggling to think of a tree that old. And less of the 'lowly' bookshelf. Bookshelves make a house a home. Been there, done that so many times. Worst job ever. Very interesting about the rings. Yeah, finding the rings made the job worth it...mostly.